Field Target is a highly competitive sport that is shot with high quality air rifles. The sport is popular all across the World. Here we will show you what we’ve learned as competitive shooters and hopefully steer you in the right direction if you are just getting started. Check back often for more from U.S. Field Target! Here’s a good video about Field Target. Take a look! First you might ask, what is a field target? Well, it is usually a metal target with a faceplate shaped like an animal. The target faceplate has a hole in it that the shooter must shoot through. The pellet travels through that hole and strikes a paddle mechanism at the rear of the target causing the target to then fall flat. Easy enough, right? Well, that all depends. 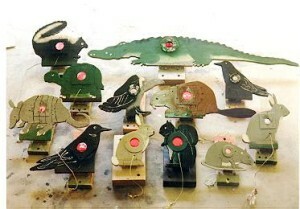 Here’s an example of some typical field targets that one might see on a field target course. Gamo Field Targets are very economical at around $25 each. Click on the image below to learn more about these targets or buy your very own! 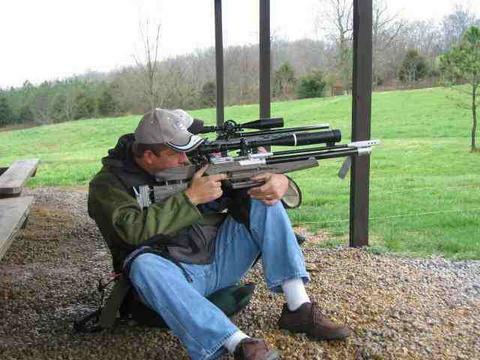 In field target, we typically shoot foremost from the seated position. We find it to be the most stable and comfortable position. We do shoot some forced position shots from the offhand and kneeling positions as well. Those lanes are designated by the match director before the match starts as such. Here’s a typical field target seated position. Now, here’s the fun part! What type of air rifles do we use. Well, it depends. In the USA we have basically two types of rifles and several divisions available for shooters to choose from. The first and most common type of rifle is a PCP (pre-charged pneumatic). This type of rifle is typically charged from a scuba tank to about 3000 psi and can shoot many shots before a refill. The next type of rifle is a spring piston rifle. These utilize the power obtained from a strong internal spring that is cocked back storing energy until you release the trigger causing the gun to fire. You can read more about the divisions that are available in the USA at our national governing web site http://www.aafta.org. This is my Steyr LG110 field target rifle. 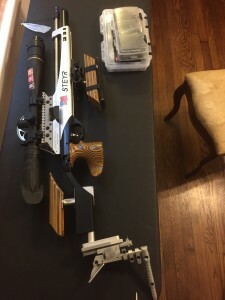 It is a PCP rifle, set up for World Field Target rules. When I started out, I used an Air Arms TX200 in the Spring Piston Division. Those are still very high quality spring piston airguns and are a load of fun to use for field target. As a matter of fact, many regional and national championships have been won with an Air Arms TX200. This is what an Air Arms TX200 Spring Piston rifle looks like. Click on the image below to learn more about this airgun or to buy one of your very own! A very successful airgun scope is the Bushnell Elite 8-32x. Click on the image below to learn more about this scope and buy one of your very own! Another great scope for your spring piston field target airgun is the Bushnell Elite 6-24. Learn more about it by clicking on the image below or buy your own here! I know this has been a very brief overview of field target, so please do more research if you are new to the sport. It is a fantastic way to enjoy the sport of shooting. It is also a great sport for family and friends of all ages. Best of luck if you are just getting started. Of course, do not hesitate to email anytime if I can be of assistance to you!